Back in December I decided to buy a candy thermometer so I could finally make homemade caramels and toffee. I ran across so many yummy looking dessert recipes last year, but couldn't try them because I didn't have the right kitchen tool or the cojones to attempt the recipe without one. So I finally buckled and bought one for a whole ten bucks. (Why did I wait so long? <cough> Procrastination!) 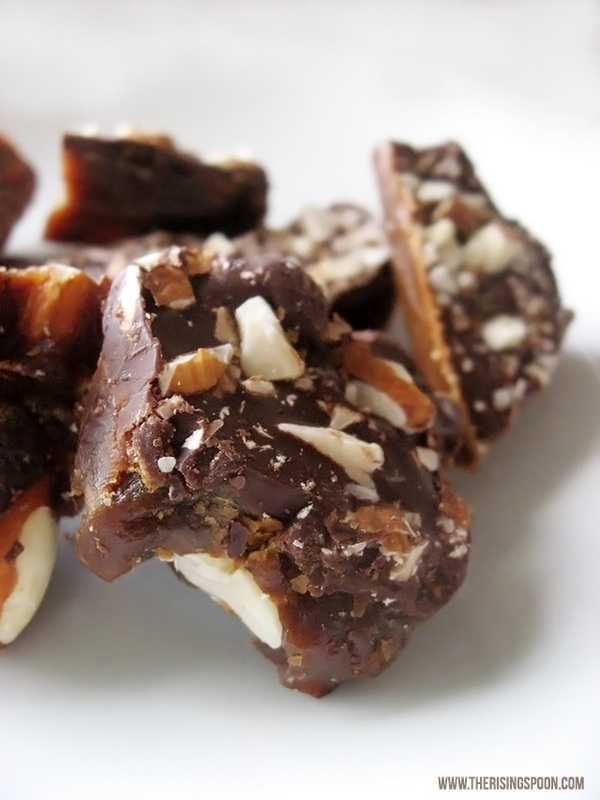 Since I had zilch experience making candy, I scoured the web for a simple caramel recipe and accidentally found a toffee recipe I wanted to try later. To my extreme dislike, damn near all the recipes called for corn syrup and sweetened condensed milk. 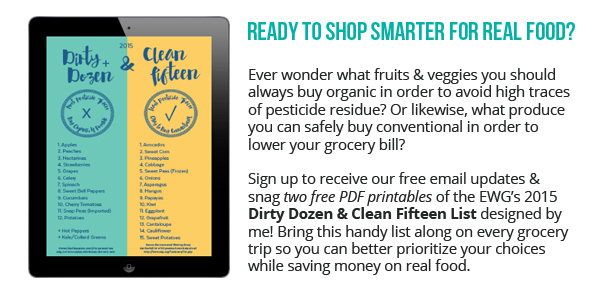 If you've been following my blog, you know I try to avoid processed and genetically modified ingredients whenever possible, so I immediately decided to try my own substitutions. Candy making is a science and relies on chemical reaction. You can't just swap out whatever is in your pantry and expect it to turn out perfectly. Long story short, my first batch of caramels failed terribly. I used full fat coconut milk instead of the canned milk and all turbinado instead of the corn syrup. I don't like making kitchen mistakes. I felt defeated. So I took at trip to the grocery store and bought a small container of light corn syrup and sweetened condensed milk. (I can feel those judging eyes!) I HAD to know if corn syrup was the magic ingredient that made it work. I searched online one more time for a "no-fail" caramel recipe and happily found a post with super specific instructions AND a step-by-step video. This one called for heavy whipping cream, sugar and corn syrup. I also found out that honey works as a substitute for corn syrup. However, I decided to use the syrup instead of honey for my first go at this version since I didn't want to waste local raw honey (it's not cheap). ANYWAY, I followed the instructions and VOILA--perfect caramels. I was ecstatic! After the caramel rested on the counter for two hours, I took a taste test. They were pretty good, but the corn syrup gave them an "off" taste. So I made a third batch, this time with raw honey and took it off the stove two degrees cooler. They turned out slightly softer than the previous batch and were frigging DELICIOUS sprinkled with flaky maldon sea salt. With a victory under my belt I was like "psssh, I can do anything", so I threw together all the stuff to make toffee from a completely different recipe. The instructions were a bit vague, but loads of people in the comments section said it turned out okay so I gave it a try. Nope. Another BIG FAT FAIL. The butter completely separated from the toffee mixture. No bueno. I threw the whole batch in the trash and did what any sane person would do; I ate more caramels. As I was noshing, I had a realization. Why not turn the caramel recipe into toffee? They're practically the same thing, except toffee is hard while caramels are soft. All I had to do was cook the mixture longer (to the hard crack stage) during the last step. This time of year, they'd make perfect Valentine's Day treats. 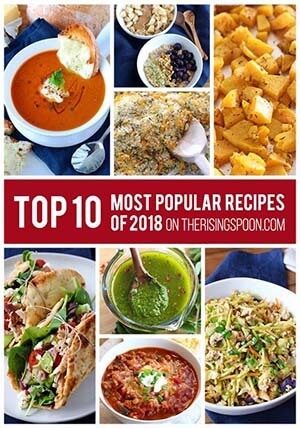 If you're still reading this, thanks for sticking with me and not skipping right to the recipe! So what was the point of my yapping on and on about my caramel experiences? Well, my failures and experimentation led to a great real food version of caramels and toffee that you can easily make at home with a candy thermometer. Here's the deal, though. Be careful with substitutions, especially the milk. It has to have a certain percentage of milk fat in order to work properly. Half and half won't cut it, nor will 2%. Just use heavy whipping cream. And real butter. My advice? Follow the recipe. Try it once to make sure it works. If it does, then feel free to experiment, although you might want to use less expensive ingredients! Learn how to make an easy homemade toffee recipe that doesn't require corn syrup or sweetened condensed milk. First watch this video so you know how to make the caramels. We will be using a slightly modified version of this recipe to instead make caramel toffee. This means we will be heating the mixture up until it reaches "hard crack" stage, so further past the soft ball stage called for in the video. Measure and set out all your ingredients and plan on staying in the kitchen the whole time. This process moves quickly. Grab the large rimmed baking sheet and cover it with aluminum foil. You do not need to grease it (if you're using foil), as the toffee won't stick once it hardens, but if you want to be doubly sure you can use butter. Place a dry skillet on medium heat and toast the 1 cup of whole almonds for a few minutes, making sure to mix them around so they don't burn. Once they're toasted, pour them onto the baking sheet and spread them in one even layer. From here, follow all the steps explained in the caramel video (see above) verbatim EXCEPT substitute the honey instead of corn syrup. Continue following the steps until you've raised the caramel mixture temperature a second time (after adding the butter and milk). Instead of stopping at the soft ball stage (240 degrees), you will bring the temperature up to 320 degrees. As soon as the caramel mixture reaches that temperature, remove the candy thermometer to a plate and quickly pour the caramel mixture onto the baking sheet and all across the almonds. If need be, use your wooden spoon to spread the caramel evenly. Wait a minute, then sprinkle the dark chocolate chips across the (now very hot & cooling) caramel toffee as evenly as possible. Let that melt for about a minute and quickly chop the remaining quarter cup of almonds. Use the same wooden spoon to spread the now-melted chocolate evenly across the top of the toffee. 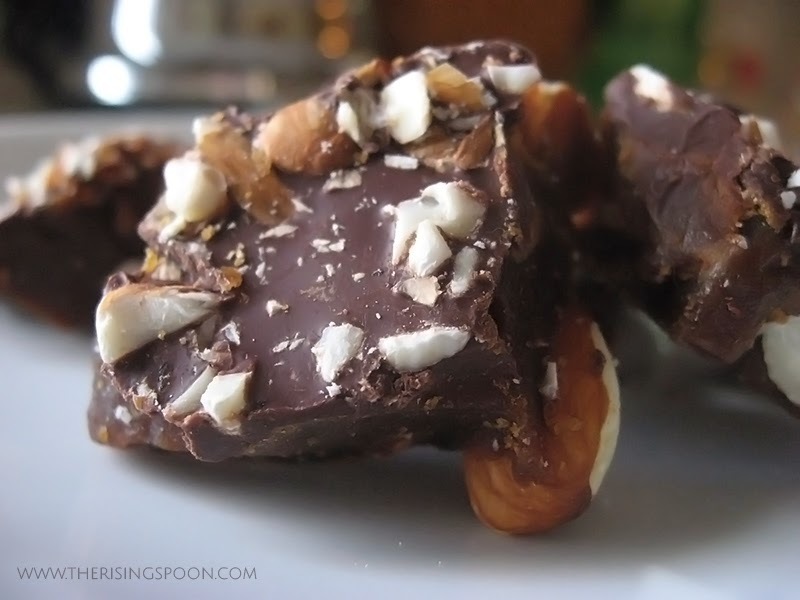 Sprinkle chopped almonds across the chocolate and let the toffee sit until cooled completely. This will take several hours. Place the toffee in the fridge and once it's really cold, break it into pieces using a hammer and screwdriver (or whatever other tools you have lying around). Afterward, store the fresh toffee in the fridge for best flavor and to make sure the dark chocolate doesn't separate from the toffee. This should keep for a few weeks (if it lasts that long). DO NOT use wax paper. The toffee will stick to it and it's difficult to get off! Don't like almonds? Feel free to use another nut or leave them out altogether. 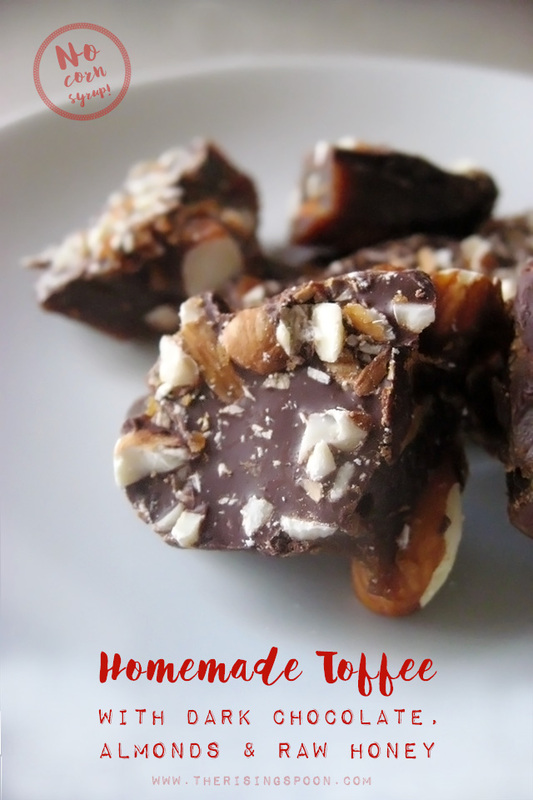 You can use this recipe to make plain toffee if that's how you like it! 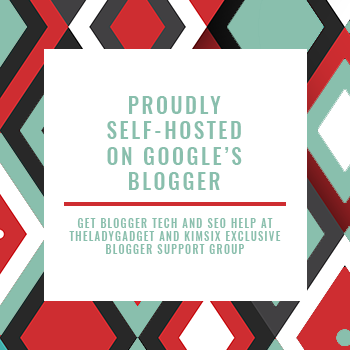 This post was shared over at Allergy Free Wednesdays, Worthwhile Wednesdays, The Wednesday Roundup, Whimsy Wednesdays, Full Plate Thursdays.